Pope Francis has been candid about his appreciation for Paul VI’s 1975 apostolic exhortation. Many theologians and evangelization experts agree that the document has remained relevant and challenging to the Church today. Readers of Blessed John Paul II’s documents have noted his frequent references to a sentence in Gaudium et Spes, the Second Vatican Council’s Pastoral Constitution on the Church in the Modern World: “man, who is the only creature on earth which God willed for itself, cannot fully find himself except through a sincere gift of himself” (no. 24). Similarly, readers of Pope Francis’ writings have observed his frequent references to Evangelii Nuntiandi, Venerable Paul VI’s 1975 apostolic exhortation on evangelization. Pope Francis has cited it at least 31 times on at least 11 different occasions, including 13 times in his new apostolic exhortation Evangelii Gaudium. Evangelii Nuntiandi is an important part of the soil from which the teaching of Evangelii Gaudium has sprung; to use another image, they are akin to two plates of a diptych. On May 17, Pope Francis said that Evangelii Nuntiandi included words that “are as timely as if they had been written yesterday”; on June 13, he called it “a very full text that has lost nothing of its timeliness”; and on July 27, as he spoke about evangelization, he called the document “that basic point of reference which remains relevant.” On June 22, he went so far as to describe it as “to my mind the greatest pastoral document that has ever been written to this day” (“per me il documento pastorale più grande che è stato scritto fino a oggi”). Popular culture and religious climate have changed much since Pope Paul wrote Evangelii Nuntiandi in 1975; in the United States that year, Captain & Tennille’s “Love Will Keep Us Together” was the most popular song, Jaws was the highest-grossing film, and E.L. Doctorow’s Ragtime was the bestselling novel. According to a Gallup poll taken that year, 44 percent of Americans had a “great deal” of confidence in “the church or organized religion”; 24 percent had “quite a lot” of confidence, 20 percent had “some,” 9 percent had “very little,” and only 1 percent had “none.” Fifty-four percent of Catholics and 40 percent of Protestants said they had attended church during the past seven days. While much has changed since 1975, several Catholics recognized for their expertise in evangelization agree wholeheartedly with Pope Francis’s assessment of the importance and continued relevance of Evangelii Nuntiandi. “Other than the Bible and the Catechism, Evangelii Nuntiandi has been the most fundamental source of formation as well as personal and organizational renewal,” says Curtis Martin, founder and president of the Fellowship of Catholic University Students (FOCUS), a consultant to the Pontifical Council for the Promotion of the New Evangelization, and an auditor at the 2012 Synod of Bishops on the New Evangelization. The document inspired my whole approach to theology and ecclesiology…. When understood correctly, evangelization will assure us, as I tell the seminarians, that we cannot be rectory or sacristy priests—evangelization moves us beyond the comfort zones that a priestly lifestyle might otherwise end looking like…I suppose the theology of evangelization challenges me to never allow apathy to keep me settled. There is an urgency in the way I live out my priesthood. Evangelization helps me better understand what “spiritual fatherhood” should look like in the priesthood and the nuptial relationship I have to the Church. In 1965, Pope Paul VI established the Synod of Bishops “to promote a closer union and greater cooperation between the Supreme Pontiff and the bishops of the whole world” and to allow for a “greater use of the bishops’ assistance in providing for the good of the universal Church.” In 1974, 209 Synod Fathers took part in the Third Ordinary General Assembly of the Synod of Bishops, which was devoted to evangelization in the modern world. Evangelii Nuntiandi was the first papal document to flow from a synod. “Even though Vatican II was called to foster renewal in the Catholic Church so that a more effective evangelization could be carried out in the modern world, right after the Council almost the opposite happened,” says Ralph Martin, director of Graduate Theology Programs in the New Evangelization at Sacred Heart Major Seminary in Detroit, a consultant to the Pontifical Council for the Promotion of the New Evangelization, and an expert at the 2012 synod. 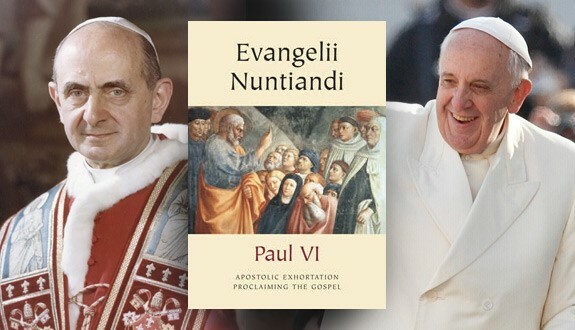 “Evangelii Nuntiandi was a carefully thought out response to the confusion engendered by both liberation theology and the conciliar recognition that ‘seeds of truth’ were found in the various non-Christian religions by clearly and eloquently reaffirming that the liberation that Christ brings is foundationally a liberation from sin and its consequences and from the devil, and that salvation is not just about changing the structures of society but is about eternal life,” he adds. One of the four aims of the Second Vatican Council, according to the opening sentence of its first document, was “to strengthen whatever can help to call the whole of mankind into the household of the Church.” Evangelii Nuntiandi was particularly significant because it led Catholics to turn their attention anew to this conciliar mandate. “Pope Paul speaks of both the conversion of consciences and the conversion of cultures, and makes the point that verbal proclamation is incomplete without the witness of life, but that witness of life is also incomplete without the proclamation of ‘the name, the teaching, the life, the promises, the Kingdom and the mystery of Jesus of Nazareth, the Son of God’ (no. 22),” she adds. In writing Evangelii Nuntiandi, Pope Paul also emphasized that evangelization is essence of the Church’s mission. “Paul VI did three vitally important things in the document: he spoke clearly and unequivocally; he spoke as a pastor with sense of urgency; most importantly, he spoke of the most central reality,” says Curtis Martin. Peter Murphy, executive director of the United States Conference of Catholic Bishops’ Secretariat of Evangelization and Catechesis and a 2012 synod auditor, concurs: “Evangelii Nuntiandi focuses on what is essential in the life and mission of the Church. ‘Evangelizing is in fact the grace and vocation proper to the Church, her deepest identity. She exists in order to evangelize, that is to say, in order to preach and teach, to be a channel of the gift of grace, to reconcile sinners to God, and to perpetuate Christ’s sacrifice in the Mass, which is the memorial of His death and glorious resurrection’” (no. 2). provides a succinct formulation of the Gospel: “In Jesus Christ, the Son of God made man, who died and rose from the dead, salvation is offered to all people as a gift of God’s grace and mercy” (no. 27). It identifies the Lord Jesus himself as the first “Evangelizer,” and it suggests eight methods for bringing the Gospel message to our contemporaries: the witness of life, a living preaching, Liturgy of the Word, catechetics, mass media, personal contact, the sacraments, and popular piety. Almost every one of the recommendations that came forth at the recent Synod on the New Evangelization is already made here; the challenge of the present situation is also anticipated, namely, the need to re-propose the Gospel to people who have been baptized but live far from Christ and from the Church. It refers to the threat atheistic secularism poses to Christians everywhere and challenges those who are reluctant to preach the Gospel and make excuses based on a faulty interpretation of the Council’s teaching. Noted canon lawyer Edward Peters, the Edmund Cardinal Szoka Chair at Sacred Heart Major Seminary in Detroit and an expert at the 2012 synod, notes other ways in which the document is significant. The prophetic words of Pope Paul VI in Evangelii Nuntiandi written in 1975 are searingly accurate today as we face the challenges of being Christian in a world of rampant secularism, materialism, individualism, and atheistic scientism. The fundamental “burning” questions posed by Pope Paul VI have not lost their ability to penetrate our hearts for Christ and are as relevant today as when they were first posed. It is clear that many Christians today do not prioritize their faith with the same level of commitment that they prioritize their gym schedule or their leisure time, and that many of our parishes are failing to address the real, heartfelt needs of our Christians. There are of course exceptions to this, but unfortunately, they are not normative. It is clear that unless the Catholic Church offers active opportunities for youth and adults to understand and dialogue with the teachings of the Church and [to learn] how to integrate the teachings of the Church into their lives, other voices and forces within the secular world will continue to influence them to believe and act outside of the faith. This is the genius of Evangelii Nuntiandi: the willingness to ask the difficult questions, to call each person to deeper conversion, and to call us to put Christ at the center of all that we say and do as a Church, as a society, and as individuals. We cannot call others to embrace Christ without embracing Christ ourselves, and we cannot challenge the culture for Christ without first allowing Christ to challenge, change, and transform us. … In order to do this we must endeavor to rediscover our own faith and to strengthen our commitment to the person of Jesus Christ, lest we fall into the pit of secularism. The life of a Christian is a life of encounter with Jesus Christ…conversion, reconversion, and evangelization. It is only when I have encountered Jesus and live a transformed life that I can then invite others to encounter Christ. 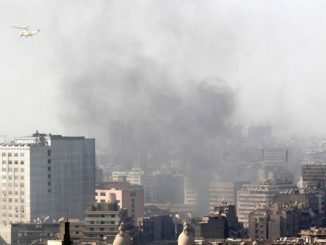 This is the great project of the Church. When we forget this central reality we fall into the danger of either moralism or social work. Jesus unites these two tendencies by elevating them. Our faith is a love story, where we strive to live rightly so that we can love and we strive to care for others because God first cares for us. We do not serve principles or causes; we serve a Person, who loved us first and has called us to imitate Him.